I've been doing some secret sewing for a very special occasion! No, it's not the prom. It's not my anniversary. 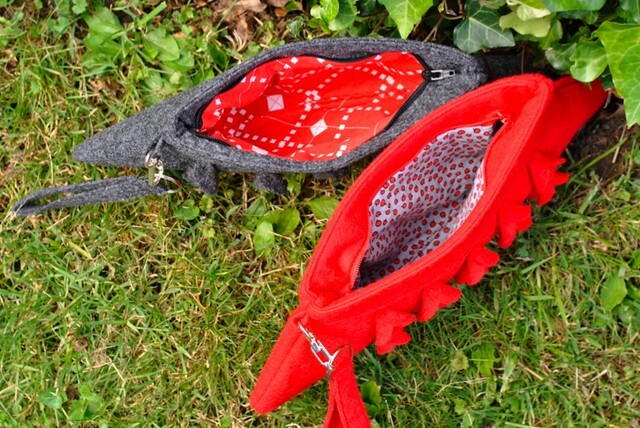 These little zipper wristlets were made especially for . . . The lovely Stitch Magazine! 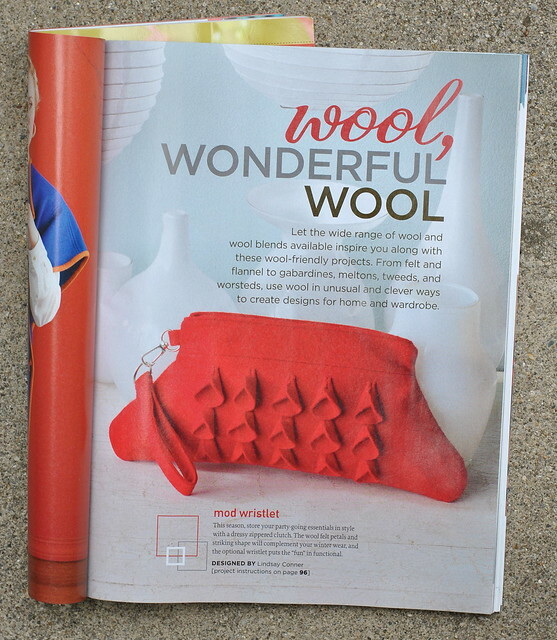 A copy of the Winter 2012/13 issue arrived, and I was so in awe to see my "Mod Wristlet" inside. The call for submissions had a prompt on sewing with wool and wool-blend fabrics. When I saw this, I thought of a clutch I'd designed about a year earlier and never wrote a tutorial for. So, I pulled it out and snapped some photos in my DIY lightbox. I've submitted some project ides to Stitch before, with no real luck. A lot of magazines have a pool of designers whose work they already know and love, and it can be difficult to break in. If you've ever felt the rejection of "no," please know that I can relate! In fact, a lot lately. It is so discouraging, but sometimes when you least expect it, someone will take a chance on your work. I'll also throw out there that this wasn't my only submission for the winter issue (I played around with quite a bit of wool and made up several sketches), but it happened to fit what they were looking for that time. The way the mag is printed, full-color project photos are in the front of the issue, broken down by theme (sewing coats, sewing with wool, etc.). 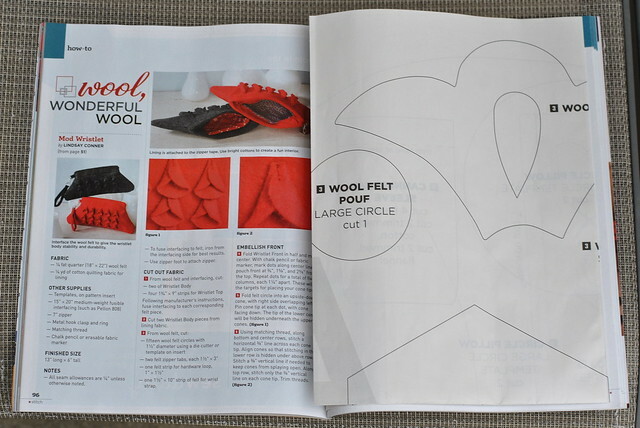 If you open up to the pattern insert toward the back, that's where the instructions are printed. I was really happy to see that they took some close-up photos of the details and showed the fun lining fabric. I love those Little Apples prints! If you are interested in writing for Stitch or other craft magazines, check out this post from Sew Mama Sew. Also, Rachel at Stitched in Color shared her submission process sketches, which you can do, too, if you don't have the project already made. 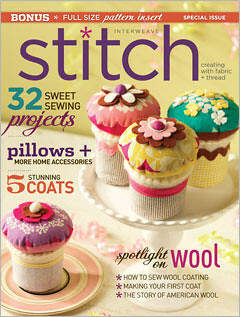 Thank you Stitch for the sweet opportunity, and here's the cover if you want to take a look at the news stands! Also, Ali has a fun project in here, so pop on over to see it. Wow, they're so cute! So fall-ish. Hey, maybe now that you've caught their eye, you'll be part of the beloved-designers pool! Great score, girl. They look fab, congrats on the feature! beautiful, i love it! i wanna make it!! don't be too discouraged. things will work out in the end. Way to go! 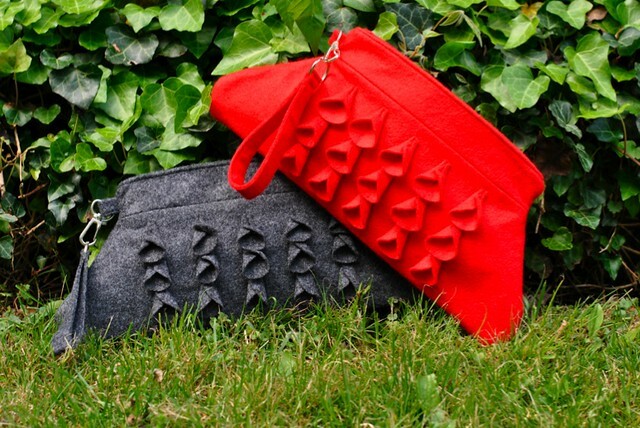 I love this clutch - very interesting and funky details. Congratulations, Lindsay! Very exciting. I love it! Congratulations Lindsay - I love the dimension you created in these! Good for you for keeping on trying!